Having a good day? Yes? No? Let me know down below! Today, I thought that I would talk to you all about an amazing event at a beautiful new bar that I went to a couple of weeks ago. A dark pink cocktail with clear pieces of crushed ice in a large clear cylindrical glass in the middle of a light pink blow up Flamingo float on a light wooden table on a light background. Coco's Beach Bar is the even more fruitier little sibling of Cabana (which if you haven't been to then click here and here to read my two posts about them) as the bar focuses more on tropical cocktails with a twist whereas Cabana focuses on giving amazing authentic Brazillian dishes and drinks. 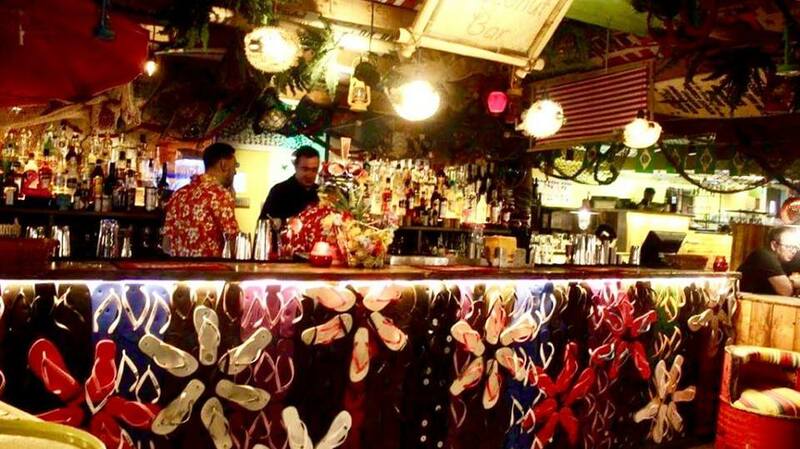 As you can tell by the name, the bar bases itself on a tropical beach. The best bit about Coco's is that all of the cocktails are £6, all of the shooters are £3 and most of the sharers are £10 from what I remember. An overview of the bar including bright lights from above, rectnagular tables and light wooden chairs on a dark background. A long rectangular counter containing decorations including pink blow up flamingos with pictures of flamingos and green palm leaves danging off the side on a dark background. We walked through Trinity Leeds to find the beautiful beach which you can't miss as it has a bright white jetski outside it. Myself and Luke then entered the bar and sat down. After a couple of minutes, a bartender brought over Sprinkles Margaritas. 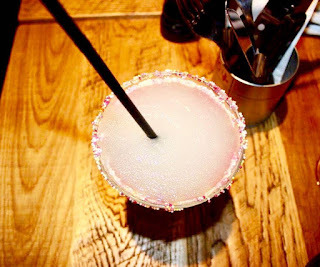 I love Sprinkles and I love a good Margarita, every now and again, so I didn't see any downsides to enjoying this amazing drink. I mean I did instantly think of Ross Geller from Friends and the speech whilst everyone is drinking Margaritas whilst drinking them but ah well. This drink contains a normal Frozen Margarita with a rim of bright Sprinkles. Two clear glasses filled with a clear frozen margarita with a rim of different coloured sprinkles with a black bowl of crackling in front on a light wooden table on a light background. A close up of a clear margarita in a clear glass with a rim of different coloured sprinkles with a black straw on a light background. 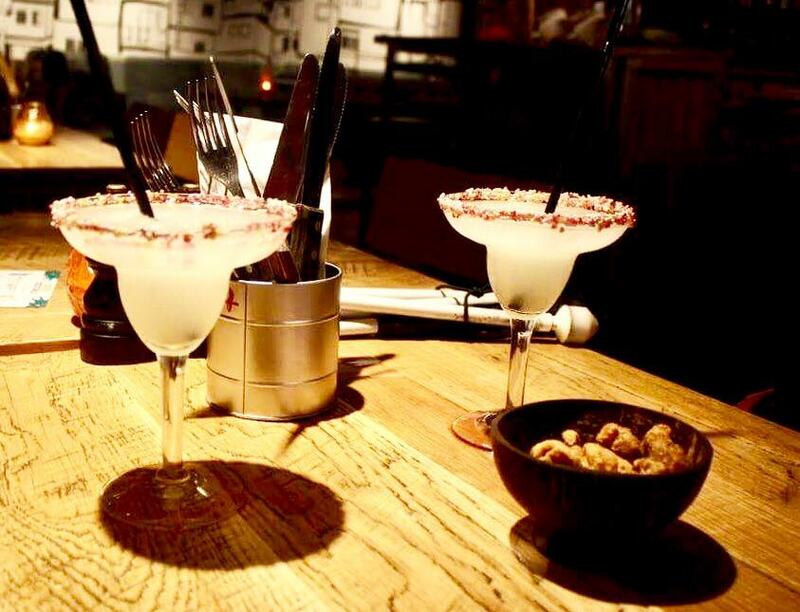 When the Sprinkled Margarita's arrived, we also enjoyed some amazing Pork Scratchings. Yes, I know that Pork Scratchings aren't normally served on the beach but these were filled with spice and were super crispy so they went well with the coolness of the Margarita. After the magical Margarita and nibbles, Cheeky Chilli Martini arrived at our table. This cocktail contains Gin, Grand Marnier, Apple Juice, Coconut Syrup and Chilli which is on the rim of the glass to look like devil horns. I'm not the biggest fan of Gin or Chilli so I wasn't that keen on the drink but I could see this being a favourite for someone who wants something different than a G&T this year but still wants to drink a little bit of Gin. I think that Gin and Apple Juice was quite a nice but different combination. A bright orange cocktail in a clear glass with two slices of red chilli on the rim on a light wooden table on a light background. Carrying on from the 'Hot, Hot, Hot' theme, next up on the cocktail train was Flaming Passion. 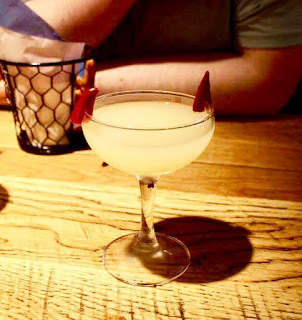 This cocktail contains Apple Juice, Vanilla Syrup, Lime Juice, Ginger, Mint, Vodka and Ginger Beer. I love anything that has Ginger Beer in so I was already sold on this but what I loved even more was the fact that it was topped off with half a Passion Fruit with a Brown Sugar Cube set on fire on top of it. I loved the fact that this drink was fresh from the Apple & Lime Juices but had a spicy kick to it due to the Ginger and Ginger Beer. Definitely one that I would drink again and again! A tall hi-ball glass filled with a bright orange cocktail with a dark puple pasion fruit on top with a black straw next to a bowl of nachos in a bright silver metal bowl on a light wooden table on a light background. A close up of a bubbly cocktail with a purple skinned and orange interior passion fruit with a black straw in a tall clear glass on a light wooden table on a light background. 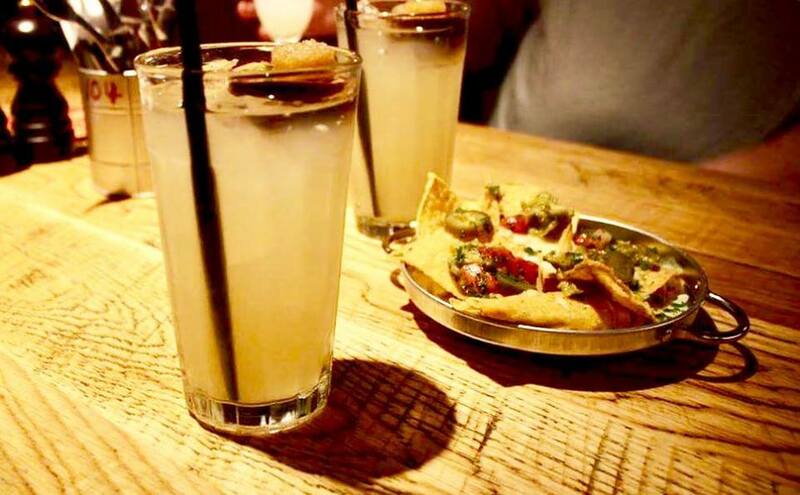 We enjoyed this drink with some Nachos which I adored. 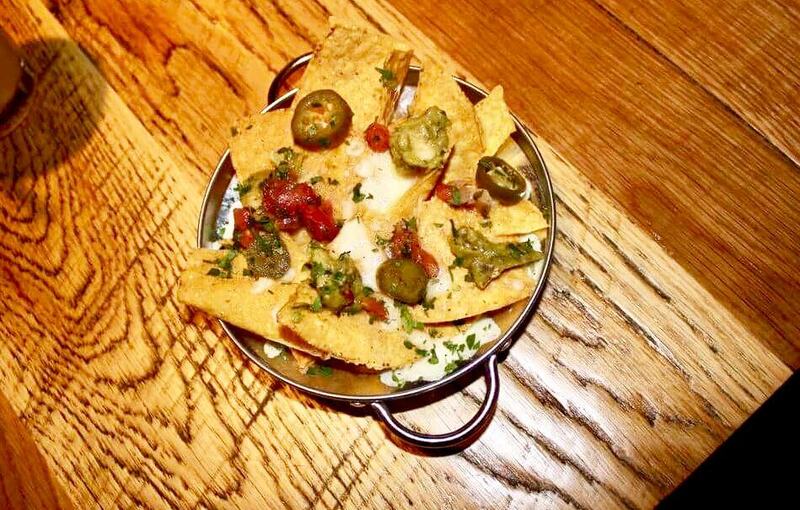 I'm always a fan of Nachos as they're the perfect snack to pick apart with friends or family. I did take a few of the Jalapeno's off as I'm weird with spice but overall I loved these and they went well with the refreshing Flaming Passion drink. Golden triangular Tortilla Chips with bright red Salsa, white Sour Cream and bright green Jalapenos in a silver metal bowl on a light brown table on a light background. Coconuts were the theme next/ We enjoyed the Bounty Hunter which if you love Bounty Chocolate Bars then you will definitely love this cocktail. It contains Vodka, Chocolate, Vanilla, Coconut and Cream. 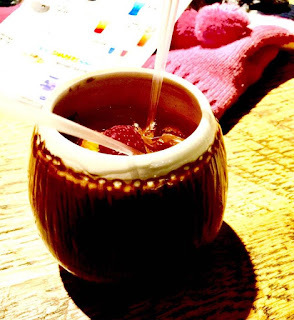 This drink is also served with a little Bounty Chocolate on the side of the drink which is served in a cute Coconut Cup. I love Coconut and Bounty's so this drink was definitely up my street. Even though the chocolate on the side would melt instantly, I'd definitely drink this at the beach on a holiday. I also think that this drink is great for the Christmas period as Bounty's are enjoyed at Christmas via the Celebrations Tub. 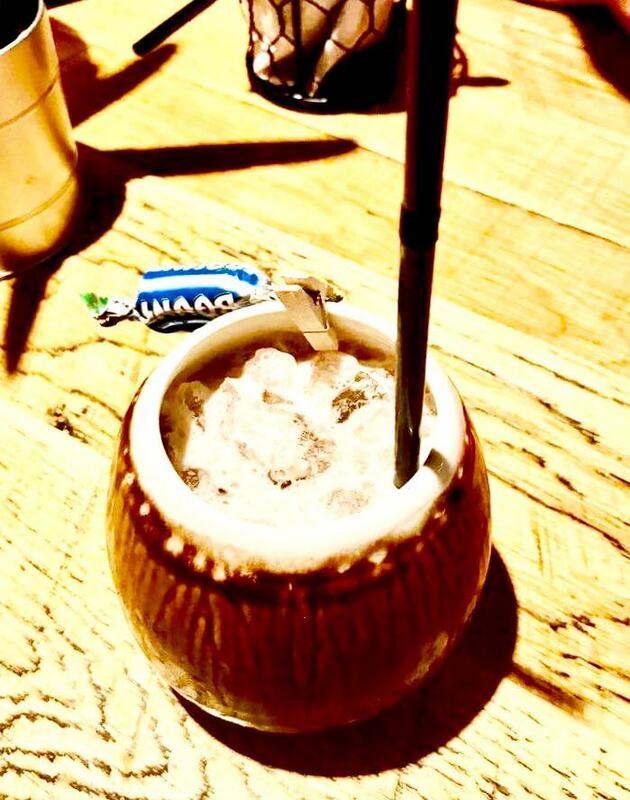 A creamy white cocktail with clear square pieces of ice with a black straw in a brown Coconut Shell inspired cup with a small Bounty Chocolate on the side of the cup on a light brown table on a light background. 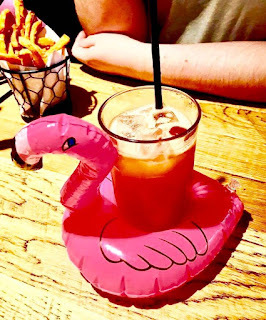 The next drink that we enjoyed was Pink Flamingo. The fun thing about Pink Flamingo is that it comes in a little Flamingo float which you expect on a beach and as Flamingos are such an Instagram trend, its a great drink to snap and share. This cocktail consists of Rum, Coconut Syrup and Orange Juice. This may sound simple but it is a delicious drink as the mix of Rum and Orange Juice creates a a slightly sour taste but then Coconut Syrup comes through and makes it a bit sweeter. We enjoyed Sweet Potato Fries with this drink and they were delicious. Honestly, I can eat Sweet Potato Fries all day! Sadly, we were filled with enough drink and food to last a lifetime but myself and Michelle rceieved a voucher for an amazing cocktail from Coco's so we went the week after to enjoy it. We both had an Island Life. which contains Vodka, Agave Syrup, Apple Juice, Grenadine, Raspberry & Passion Fruit Puree's. 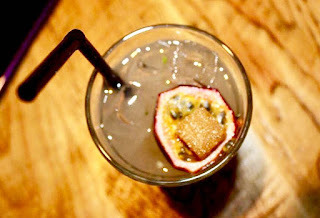 I love anything Passion Fruit but also I thought adding Agave Syrup was an interesting thing to do as I know a lot of cocktails contain a general sugar syrup. Raspberries in a Cocktail are always a fab thing as you get to find and eat the Raspberry itself. A dark red liquid containing red Raspberries and dark Purple Passion Fruit with a clear straw in a brown Coconut Shell inspired cup on a light wooden table on a light background. 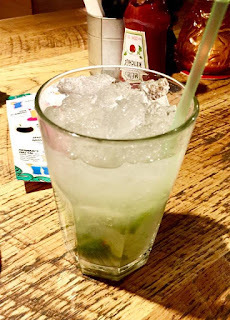 We were also given a free Caipirinha due ti the staff training to make them. This contain wonderful Cachaca and Lime to create a refreshing cocktail. I loved it as it was bright, zingy and something great to drink before some amazing food to eat with great friends. A tall clear glass containing a clear cocktail with clear crushed ice and green bits of Lime Zest at the bottom on a wooden table on a light background. Have you checked out Coco's Beach Bar? Let me know down below! 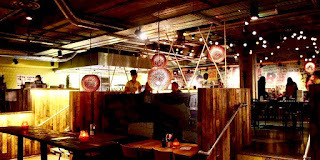 Click here to find out more about Coco's. Thanks to the wonderful staff at Coco's for having us and the wonderful staff at Trinity Leeds for inviting myself and Luke to the launch event. I hope that you come back next time for another interesting blog post.